Kay(Meryl Streep) is a woman who has been married to Arnold(Tommy Lee Jones) for a long time and is deeply unhappy. They sleep in separate beds, and Kay feels they have no intimacy. 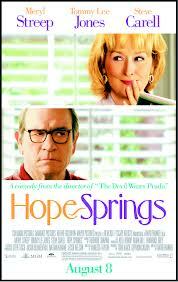 She books them in to a marriage workshop in the town of Hope Springs. (Steve Carrell) works with the eager Kay and Arnold, who feels that everything is as it should be, and is cynical about change. The opening sequence with Kay dressing in a slinky nighty and entering her husband’s bedroom to seduce him sets up the story of a marriage without sexual intimacy. It shows him as a grumpy old man and her as a woman who wants to change her situation. But then she seems to fall into a more passive role – although how this is possible when it is her actions that drive the film, I’m not sure. This is clearly a film for an older audience, but I still enjoyed it. It gave me a few chuckles and even the odd tear, but it certainly was nothing controversial or ground breaking. I was surprised to see that Streep has been nominated for a Golden Globe for her performance – it seems that she gets nominated for everything because she has been wonderful in so many films, but I don’t think this was really her best.